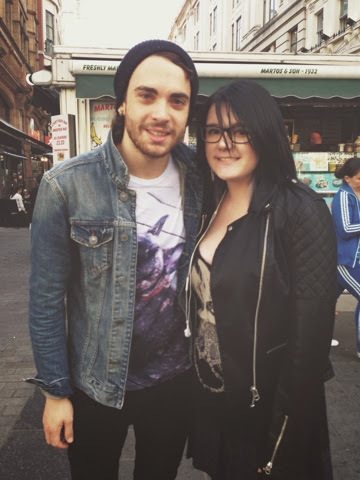 Kirstiekins Blogs: I met Taylor York! So there I was causually walking out of oxford circus tube station to meet my friend Viki (as we're going to this beauty blogger event in Benefit with Tanya Burr) , and guess who was standing right there! TAYLOR YORK!! If you read my previous posts about Paramore, you'll know that I'm a massive fan, and if you actually know me you'll know that massive is a huge understatement! I recently got a Paramore tattoo (see previous post) and I showed it to him, and he said it was super cool and rad! Today was just totally unexpected and at first I wasn't sure if it was even him, I didn't even know what to say apart from, "excuse me, are you who I think you are!?" And so which he replied "I might be" and gave me the cheekiest smile ever! I automatically started shaking and then we hugged, and just seriously!! There are no words to explain how awesome today was! Thank you Taylor for this photo, you have made my entire life!! Plus, look at the shirt he is wearing!! BILL!! !